Lam (not real name) is a 66-year-old Indonesian. Sometime in early 2012, his stomach started to grow bigger and bigger. There was no pain. The doctor checked his lungs. They were alright. Lam was told that he might have appendix infection or TB. He was on TB medication for a week. 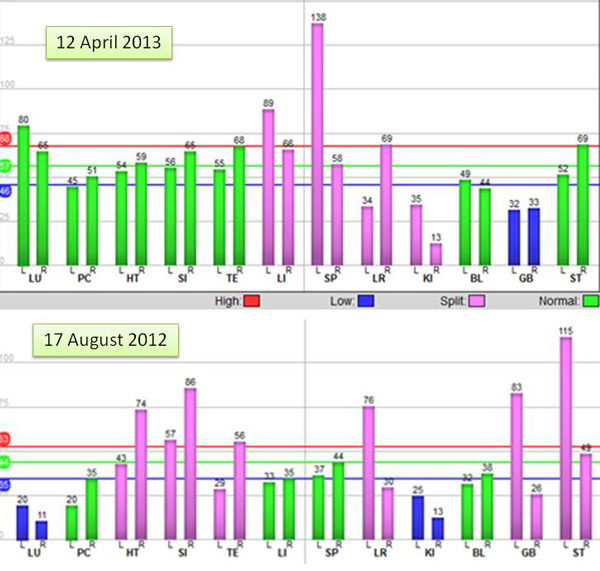 Below is the CT scan report of the abdomen and pelvis on 27 July 2012. The next day, a peritoneum core biopsy was done. The result: Few atypical cells seen! No malignancy is seen. In simple language, the biopsy could not tell what was wrong. An endoscopy done on 28 July 2012 indicated: Large tumour felt in the Pouch of Douglas. On 4 August 2012, a second biopsy was performed. 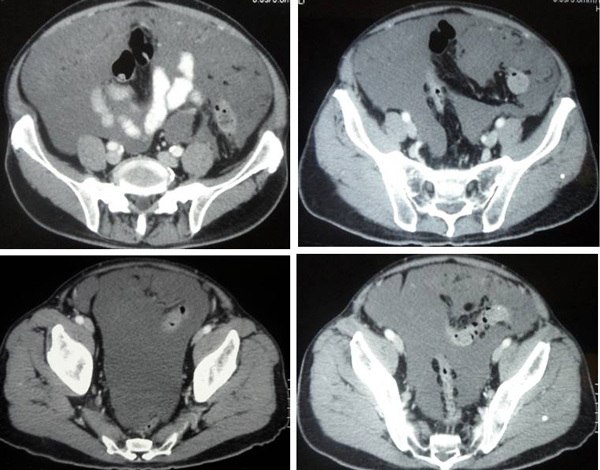 The result confirmed Pseudomyxoma peritonei (omentum and peritoneal tumour). Note: Pseudomyxoma peritonei is a very rare type of cancer and is often a slowly progressive disease. It usually begins in the appendix as a small growth or polyp. Or, more rarely, it can start in other parts of the bowel, the ovary or bladder. This polyp eventually spread cancerous cells to the lining of the abdominal cavity or the peritoneum. These cancerous cells produce mucus, which collects in the abdomen as a jelly like fluid called mucin. The cause of this type of cancer is not known. Lam was subsequently referred to an oncologist who recommended 6 to 8 cycles of chemotherapy. Lam refused chemo and sought a second opinion from a doctor in the Singapore General Hospital. Lam was told to undergo surgery to be followed by chemotherapy. Again Lam refused. Lam then came to Penang and consulted with a surgeon in a private hospital. The surgeon told Lam not to undergo any surgery because this might further spread the cancer. He was asked to opt for chemotherapy instead. Subsequently, Lam saw an oncologist and was told to undergo 3 cycles of chemotherapy. If chemo did not yield the desired results, then Lam should stop the treatment. The chemo regimen consisted of an infusion and an oral drug which Lam was unable to tell what these are. Lam was told that this would be just a trial – no one would know what the outcome would be. Lam and his wife were in a dilemma. Lost and unsure of what to do, they came to seek our help on 17 August 2012. It was a somber encounter indeed. I was dumbfounded after looking at the CT images below. I have never encountered such a case before – let alone know how to manage it! 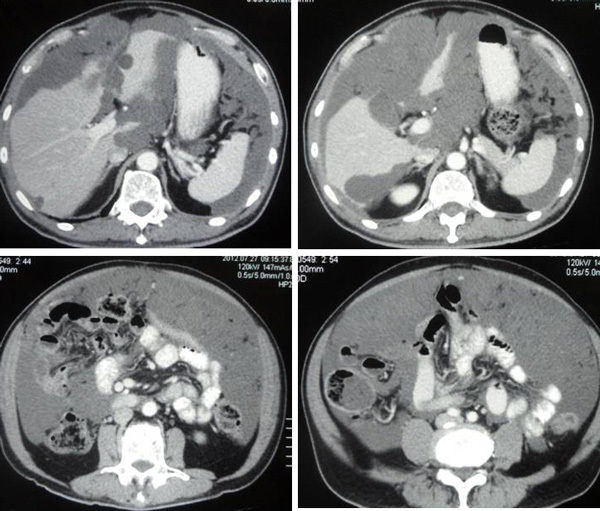 Lam’s abdomen was distended due to the jelly-like fluid which filled up the peritoneum and omentum. Upper most in my mind that day was – I have to be honest with this patient. I don’t want to mislead him by offering him some “fake” treatment. I say fake because I have never treated such a case. Listen to our conversation that day. No one smiled, no one laughed! The prognosis was grim. I shook my head in despair. It was a sober occasion. No, never in my wildest dream would I be able to help Lam to get well. But I knew one thing – like I always do. If I am sincere and honest and know only 50 percent – I know that God, the Almighty Healer will bless the patient with another 50 percent to make it whole. At CA Care, I lived by that principle and therefore would not give up. During our consultation, I went through the various options with Lam and his wife again. First option – surgery. But even the surgeon in Penang did not think that this would bring any benefit. It is not likely that all tumours could be removed by surgery. Some may be left behind. Surgery could further spread the cancer. Indeed Lam himself did not wish to take this path. 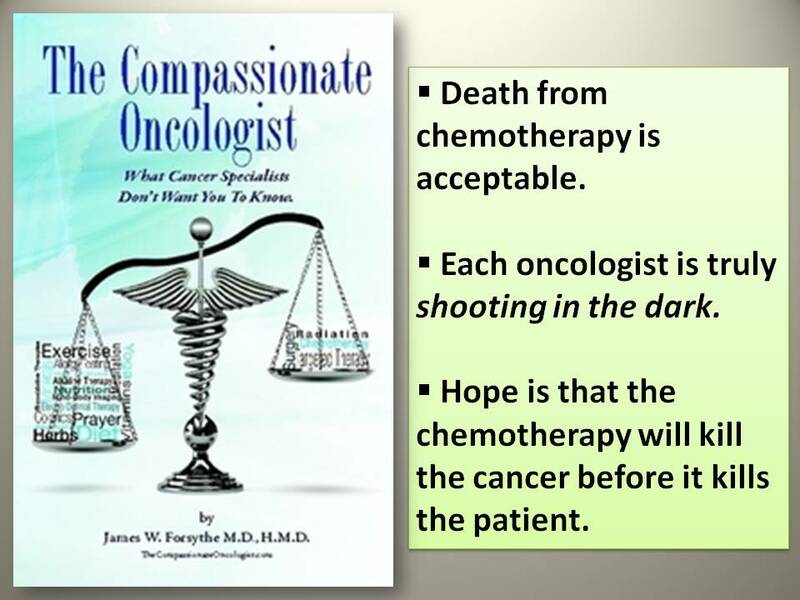 The second option was chemotherapy. But would it cure? Not likely. The oncologist suggested starting with 3 cycles but if these were not effective, Lam should stop the treatment. This did not sound inspiring at all. However, I told Lam that this would probably be the only option left. Why not try chemo and after 3 cycles he could come back to us for help if chemo really could not help him. 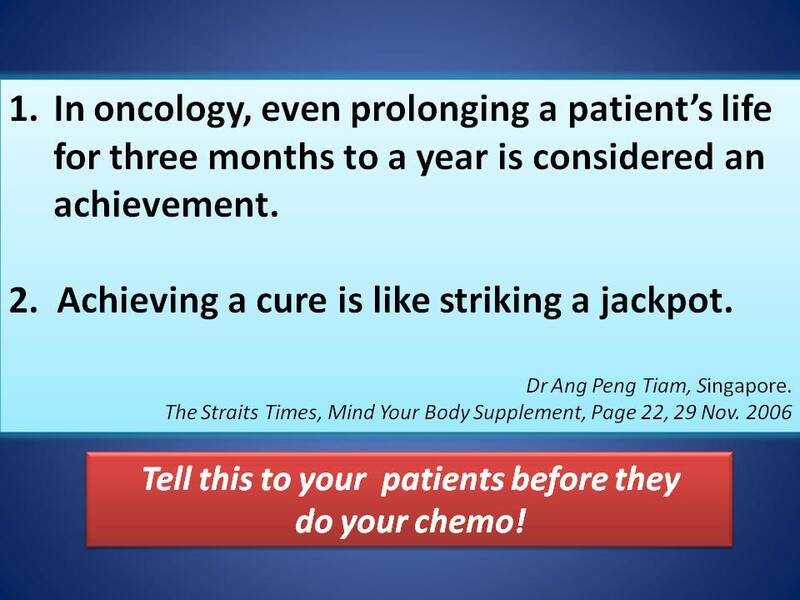 Take note and make no mistake, at CA Care we tell you to go for chemo if indeed the situation warrants it. However, Lam was reluctant to go for chemo. He asked if I could offer him another way out. Can he take some herbs? I understood his predicament –it is like selecting between the Devil or the Deep Blue Sea! Okay, I made this bargain with Lam. He would take herbs and be on our diet for one month. If after one month, his conditions deteriorate then he should go for chemo! Lam’s wife interjected: Would it not be too late by then? By that time the cancer would have spread more. My response to that was: It is already late anyway. You have this cancer for the past seven or eight months! The cancer has already spread. Perhaps, cancer patients ought to realize this –you can’t expect to win all the time! That is a kiasu attitude. Lam decided on the CA Care Therapy path! Then, I told them: Come back and see us after one month! At this point, let me explain why I agreed to help Lam. It would have been easier for me to send him off somewhere else. 1. First, know that we don’t play god at CA Care. We ask you to seek doctor’s help. Many people think we are anti-doctor because often we don’t agree with what doctors do. Only mediocre mind think that way. 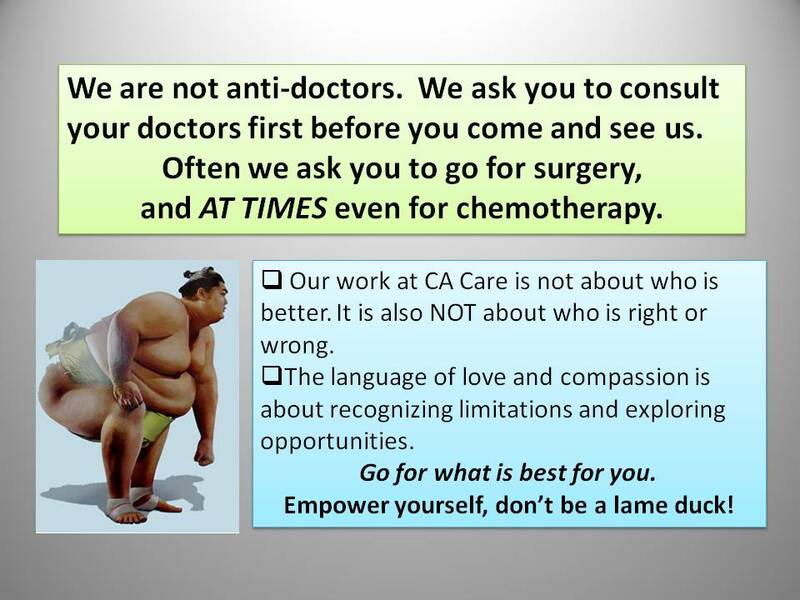 At CA Care, our patients come first. We want you to get the best. In this case, I even asked Lam to try chemotherapy and he can always come back to us for help if chemo failed him. Let me repeat: The language of love and compassion is about recognizing limitations and exploring opportunities. To condemn others as quacks without basis is not a language of love and compassion. 2. From my reading, I am fully aware of the limitations of medical treatment for cancer – even more so, when dealing with such a rare type of cancer that Lam has. Reflect on what medical experts themselves say about their treatment. 3. Knowing the limitations that Lam had to face, would I not be able to provide him with another option? How much worse off would Lam be if he was to follow our CA Care therapy? For sure I know Lam would not have to suffer any severe side effects of chemotherapy. The herbs and diet are not going to kill him either. 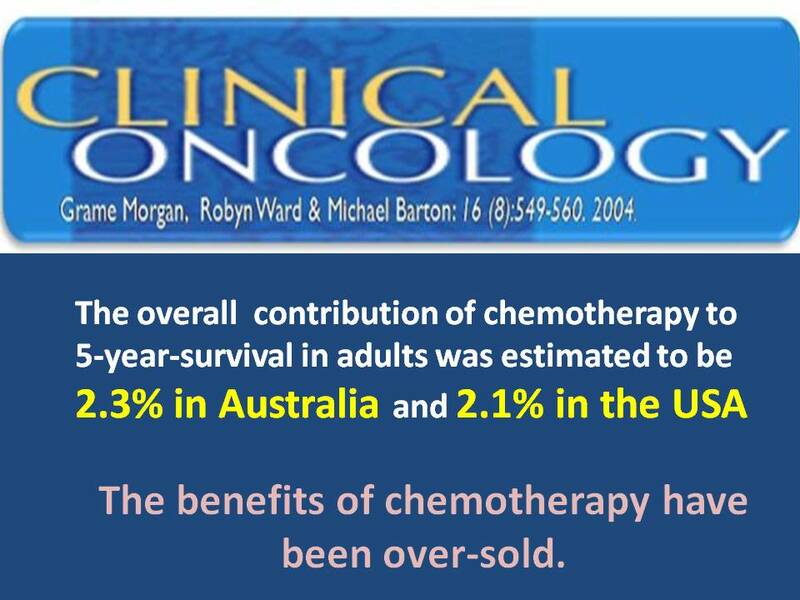 Like Dr. James Forsythe said chemo can kill! Patients have cancer. They die. 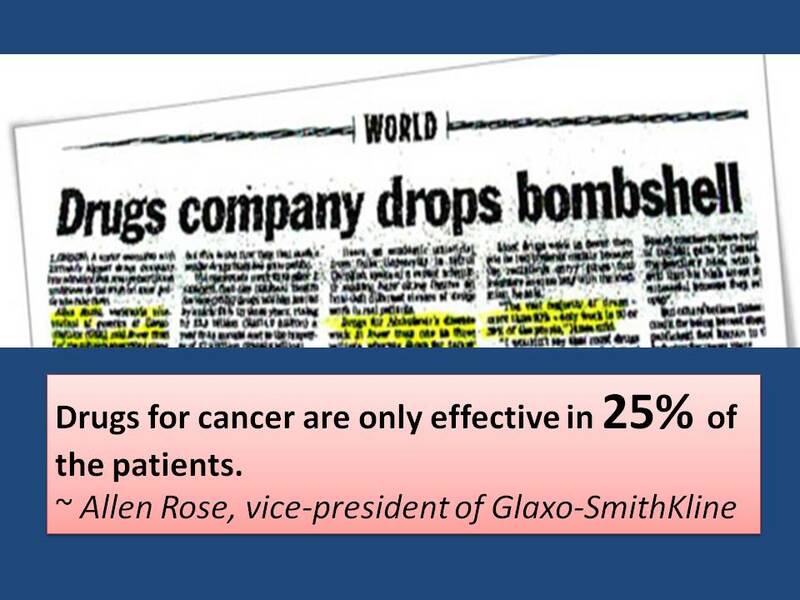 Some die because of the cancer, but some die because of the treatments. Let us not deny or pretend we don’t know this reality. And because of this, I found it hard to send Lam away. As you can see in the video, I have admitted my desperation. I did not know what to do with him. But my conscience is clear. I was not trying to mislead or exploit him! Cost-wise, herbs are much cheaper than chemo anyway. So, there is nothing much to lose in terms of money, in the event that our therapy did not give us the desired result. Based on these premises, I asked Lam for only a month to “gamble” his life with. If Lam’s condition worsen, he should go for chemotherapy! If you are not a kiasu type perhaps this is a fair deal! But it is up to him to decide what he wanted to do. Nothing in this world comes without any risk! And that is the risk Lam had to take. He had to decide for himself.